Marco’s variation on the bass muddler. 1. Start thread above barb of hook and tie in flat section of foam. 2. Tie in the tail (1/3 length of hook shank) and fritz. Wind the thread forward to about 1/2 the shank length from the eye. 3. Wind the fritz forward over the foam and tie off at the same point. 4. Stack a clump of deer hair in a stacker and tie in directly in front of the Fritz on top of the hook. The tips should extend to the bend in the hook. 5. Tie in a small bunch of marabou directly over the deer hair (colour of choice) and 4-5 Peacock Herls directly on top of that. 6. Stack a thick clump of deer hair in the stacker and spin a collar around the hook shank. 7. Repeat the above step (stacking no longer required) over and over until the front third of the shank is covered. make sure to pack the hair tightly back after each application. 8. Tie off the thread behind the hook eye and apply a drop of head cement, then shape the head with scissors or a sharp razor blade. 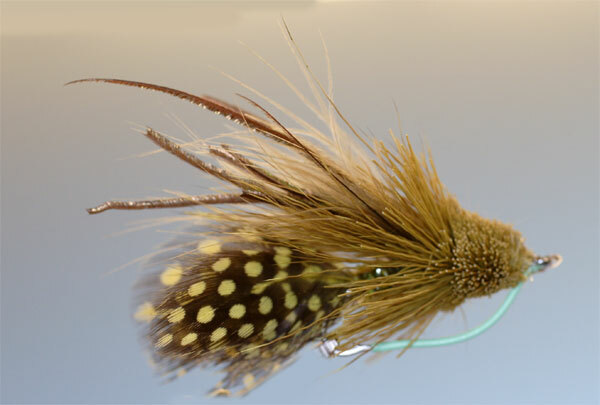 The larger the head and collar the better the pattern will float. Note: The collar particularly the bottom provides most of the buoyancy to the fly. Clipping the bottom close to the hook shank results in a loss of buoyancy thus allowing the fly to fish sub surface.